The U.S. government has approved the first noninvasive brain stimulator to treat depression - a device that beams magnetic pulses through the skull. 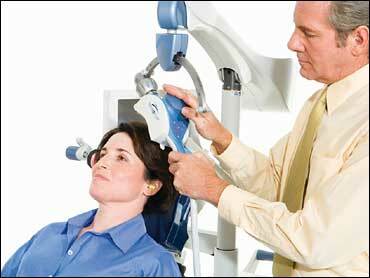 Called transcranial magnetic stimulation or TMS, this gentler approach is not for everyone. The Food and Drug Administration approved Neuronetics Inc.'s NeuroStar therapy specifically for patients who had no relief from their first antidepressant, offering them a different option than trying pill after pill. While there's a big need for innovative approaches - at least one in five depression patients is treatment-resistant - the question is just how much benefit TMS offers. Quantifying the benefit is key, considering the price tag. TMS is expected to cost $6,000 to $10,000, depending on how many treatments a patient needs, says Dr. Philip Janicak of Rush University Medical Center in Chicago, who helped lead the NeuroStar study. That's far more expensive than medication, yet thousands of dollars cheaper than invasive depression devices. Neuroscientists have been using TMS for years as a research tool in brain studies. Zap a powerful magnet over a certain spot on the head - where motion is controlled - and someone's arm can suddenly, involuntarily, lash out. Beyond the "wow" factor, magnetized pulses were triggering brain activity. The FDA cleared the device after focusing just on a subset of the patients initially enrolled - 164 who had failed one antidepressant during their current bout of depression, not those who were more severely treatment-resistant. After two weeks of treatment, Newman was wondering if he was getting the sham - when suddenly, he started feeling lots better, and doctors spotted a corresponding major improvement in his depression measurements.